Podcasts are audio programs that are made available on the internet. They are downloaded to your computer or phone for playing anywhere or anytime. They are great for learning and staying engaged with all kinds of topics. 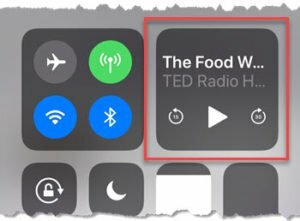 The Apple Podcasts app is the built-in tool for managing your search, subscription and playback of the podcasts that you choose. Podcasts are often talk programs that are part of a series. You can subscribe to the series and have each show or episode automatically downloaded to your device. And unlike shows broadcast on the radio, you can listen anytime or any place including in your car, in your home or even in your bed with a sleep timer. How Many Podcasts are there? Will I find something interesting? Many podcasts are original content created specifically for podcasts. But many podcasts are also recorded broadcasts of a television or radio programs, lectures, performances, or other events. 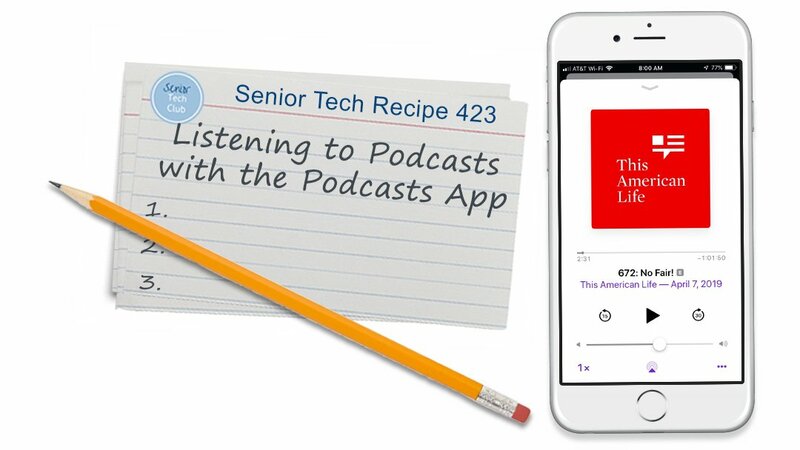 The Podcasts app on your iPhone or iPad provides easy access to podcasts. Although you can explore other podcast apps, the Apple Podcast app is built in and provides search, subscription and playback tools that will serve most people’s needs. Let’s do a quick tour of the tabs at the bottom of the screen and review the functions of the Podcasts app. The Player Bar will display once you start listening to podcasts. It will provide a basic control for the podcast that is currently playing. Tap on the Player Bar to display a complete control of the playback function. See Listen to Podcasts below. Here you’ll see new and unplayed episodes from your subscribed shows, recently added episodes and recently played episodes. Browse the list by swiping up. Tap any show to listen. Your subscriptions will control which episodes are displayed under Listen Now. Your Library will display all of the shows and episodes that you have either subscribed to or have manually added to your library. You can click Episodes to see individual episodes. Tap Downloaded Episodes to display episodes that have been downloaded to your device. Featured podcasts are podcasts that Apple editors have deemed to be newsworthy. Top Charts are the popular podcasts. After tapping Top Charts, tap All Categories on the upper right in order to get popular podcasts in topic categories. From the Browse Tab, Tap on any episode to start listening or tap + to add it to your Library so that you can listen to it later. Tap Search to access a search bar where you can either search in Your Library or All Podcasts if you are searching the vast Apple library for a specific podcast or specific category. For example, if you want to find a podcast on Woodworking, type woodworking into the search bar to display the results. Tap Browse, Top Charts, All Categories (upper right) and select a specific category to browse. Tap Search, All Podcasts and type a topic into the search bar and tap Search on your Keyboard. An option when you find a podcast that you like is to subscribe to the podcast. If you tap on the podcast to display the show’s info page. On the info page you will see a button. When you subscribe to a podcast, new episodes will be automatically downloaded to your library. This is a great way to stay current with new episodes of your favorite podcasts. When an episode is downloaded onto your device, it will not use cellular data in the playback. Unsubscribe by tapping , then tap Unsubscribe from the podcasts info page. Tapping on any show in the Browse or Search list from display the show info page. The top of the page will display a summary rating (left below) at the top indicating the number of stars out of five and the number of ratings. Swiping up to scroll down the info page will display episodes, Best of the Podcast and Ratings & Review (right below) will you can see more ratings detail and also a list of written reviews that you can use to assess a podcast. Saving Cellular Data and Storage. Turn off Automatic Downloads – If you are running short on storage on your device, you can turn off automatic downloads. Go to Settings > Podcasts > Download Episodes and choose Off. Do Not Use Cellular Data – If you want to ensure that you do not use cellular data against your limited data plan, you can turn off Cellular Data. Go to Settings > Podcasts > Cellular Data and choose Off. Go to Settings > Podcasts > Only Download on Wi-Fi and turn On (green). Only Download on WiFi – If you want to only download when you are connected to WiFi. The bottom of the Podcasts app screen provides a player bar with the podcasts title, a control to stop, pause or skip ahead. Tap on the player bar to retrieve a full playback control as seen below. 1] Play/Pause the Podcast. The button switches between functions. 2] Skip ahead or back 30 seconds. 4] Progress bar displays the elapsed progress in time and how much of the podcast is left to play. 5] Increase playback speed in order to listen to an episode faster. 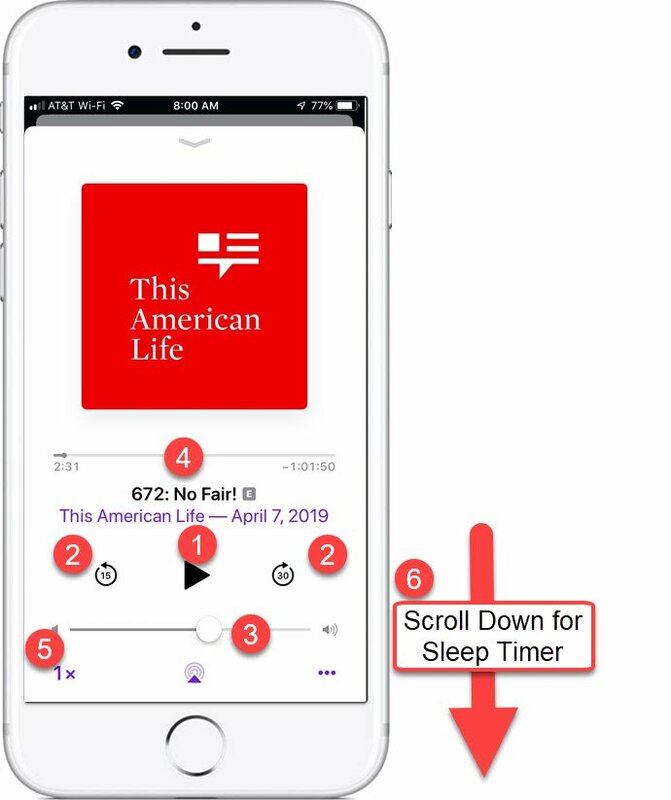 6] Sleep Timer – Swipe up to see the Sleep Timer if you want to stop playback at a certain interval or after the episode ends. The Control Center also provides basic playback controls for Play/Pause, Skip and Volume. These work great for on-the-go playback of your podcasts. Siri can help you keep up with the podcasts that you follow. This may be essential when playing podcasts in your car. Five Smart Podcasts to Get you Started. With over a half million podcasts available where do you start. After you start, you’ll surely develop your own tastes and preferences. You’ll be able to find and subscribe to a few podcasts that match your interest and passion. However, to get your started here are five recommendations from my playlists. Every weekday, Ted Talks puts their latest talks in podcast format so that subscribers can listen on the go. With over 2,800 talks, seniors can hear ideas on nearly every subject imaginable – from AI to zoology, Ted Talks brings together the world’s leading thinkers and doers to create an inspiring space in podcasts. I loved the Freakonomics books and this top-rated podcast can help you understand basic economic principles and how it fits into nearly every aspect of their life – from pop culture to retirement. The Daily is a daily news podcast by The New York Times. It is based on interviews with journalists from the newspaper and will summarize and comment on world news. It is a great way for seniors to stay connected and informed on global news. The mission of Stuff You Should Know is to educate the public about common things and how they work. It is a smart and unusual series that science lovers will enjoy, covering topics from life in a beehive to criminal forensics. Produced by NPR, This American Life is a popular podcast series. It is hosted by Ira Glass and includes stories ranging from military life to summer camp, stories are varied and different topics entertain and educate. True or False – Podcasts are usually free to listen to. How do you subscribe to a podcast show.